Chain mail is one of the hottest jewelry trends out there; add beads and the style positively sizzles. Who could resist? Bestselling author and chain mail expert Dylon Whyte presents his time-tested, time-saving techniques with 26 breathtaking projects, ranging from extremely simple to challenging. A thorough introduction, illustrated with computer-generated pictures, covers the basic techniques. Then Whyte reveals his patented, perfected beading method: rather than using difficult wire wrapping, he threads the beads directly onto the rings before theyre fashioned into chain mail. Thirty exciting projects include a delicate Persian patterned anklet, embellished with tiny silver bells; an amethyst opera-length necklace; and silver earrings shaped like inverted peacock feathers, edged with rings and turquoise beads. Dylon Whyte has been studying and making original chain-mail creations and patterns for more than 20 years. 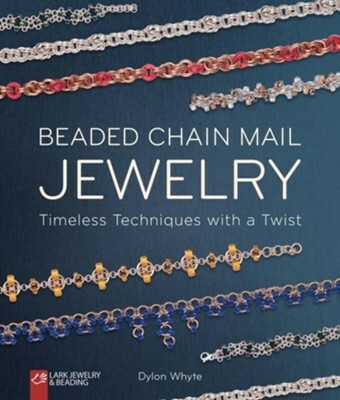 He has written and illustrated a self-published book on the construction of chain mail and is the coauthor of the bestselling Chain Mail Jewelry (Lark). Dylon lives on Manitoulin Island, Canada. I'm the author/artist and I want to review Beaded Chain Mail Jewelry: Timeless Techniques with a Twist.